I dropped a hint in my last post that there was something new on the horizon - and now I can reveal the full extent of "Project X-27", as it was dubbed by Steven Roy. Remember all those articles on websites pointing out how all the print F1 magazines have degenerated over the last decade or so? 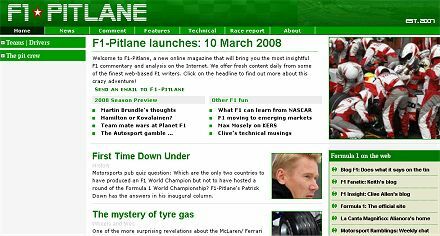 Well, as from today, there is an alternative: all the best F1 writers on the net have clubbed together to contribute to a new online magazine entitled F1-Pitlane. This is the brainchild of John Beamer, a long-time F1 enthusiast who has previously directed his energies into creating a successful baseball magazine on the net. Now he turns his attention to his other sporting passion and F1-Pitlane is the result. The intention is to provide excellent, well-written articles on the background, history and latest news within F1 and the team assembled reads like a list of the foremost F1 bloggers. As a contributor and editor myself, I am honored to be in the company of such writers as Keith Collantine of F1 Fanatic, John Beamer himself, Alianora la Canta (La Canta Magnifico), Patrick Down (Motorsport Ramblings) and Christine Blachford (Sidepodcast). Add to the list some of the best-informed and articulate commenters on F1 blogs (Steven Roy, Alex Arnet and John Ferry) and we have one of the most powerful writing teams ever assembled. In addition, we are assembling a database of F1 facts and figures which will be added to and updated constantly. We also plan to include a newsfeed so that readers always have access to F1 news as it happens. I think it is very telling that so many F1 bloggers and writers have agreed to contribute to the magazine. That amounts to a considerable commitment of time and energy from their busy schedules and demonstrates the excellent spirit of mutual trust, respect and goodwill existing within the F1 fraternity. It shows, too, that F1-Pitlane is intended to belong to all who love the sport; it is your magazine and you can help to shape it into the publication you want to read. Suggestions, comments and contributions will be welcome and taken into account as the site develops. Have a look and let us know what you think, either through the poll onsite, the comments or email. But, most of all, enjoy! Since the middle of the last year, I´m reading all of with you through these blogs. I must admit Clive, that your blog and this guy´s comments, changed my conceptions about Formula 1 since then. So I must to thank you and all these guys too. Another thing is that I´m a fan of Alianora, Arnet and Steven points of view! So it is fantastic to know that all of you are now together at the same place! Congratulations and thank you, Clive! It's always good to know where readers hail from, Becken - and I have been a fan of Brazilian drivers over the years, particularly Piquet (Sr) and Senna. I only wish that I understood Portuguese so that I could read your blog! Great post Clive .... and I'm not at all biased. I promise! I will certainly keep my eye on the FIA and its complicated machinations, Ravino. But this is a good chance to point out that all shades of opinion will be welcome in F1-Pitlane - only today I received an article that supports Bernie's handling of F1's finances and it will be published soon. Never let it be said that we don't give everyone a fair skake of the whip! Thank you, John - and I know you to be scrupulously fair in your assessments! I guess after that build up I better go and write something interesting. I am looking forward to reading what everyone else writes. Just wondering, is there a reason that I'm listed as Sidepodcast rather than my name? Shall I edit it so it shows your name rather than Sidepodcast? I thought that was probably the case. I don't think he's going to be contributing in the short term, so maybe change it to my name for now, and we'll think of something when he finally has some time on his hands. Great news and I hope it really works. Its about time some opinion got into the reporting of F1 and the technical reports are cool. Glad you like it, Corey - we'll do our best. Interesting site you have there. It's good to see that the seeds of motorsport's future are alive and well amongst the students of today! "Okay, will do, Christine. And who knows, his identity might be revealed yet..."
hmm, we'll see! apologies for not writing from the off. pretty sure my blogging ratio is down this month too. will have to try and keep it all in check. love the site, love the concept, i may be able to renege on the annual autosport journal subscription soon. Thanks, Punter. They are indeed a bunch of excellent guys and gals! Will head on over & check out the new sight as soon as I have done the rounds of the others. Oh God, I am never going to get any work done now ! All contributions gratefully, received, Sidey. Thanks for the kind comments. Do you think that as Max surfs the web, "just to see how the little people are thinking", that he just may slip on over? I think I am becoming a little hard on the man. I should ease up. Does anyone have an example of something positive that he has done lately? Something that may be worthy of an article or even post? I would like to offer him equal time on me. Pink I agree to much to read and so little time. Imagine how busy we will be once the season starts. An example of something he's done right? Recently? Now that's a hard one. Many people were quite impressed with how quickly he reacted over the Spanish "racist" matter, but others have criticized his establishment of "Racing Against Racism" as being over the top. And at least there is a suspicion of a sense of humor in his statement that he reads the blogs for laughs. Why, the man has even said he'd like to write a funny book after he retires. I read that Max is an accomplished snow-boarder. That's as far as I'm willing to go. Looking forward to contributing. And keeping Max's feet to the fire! Since Christine is moaning about her name I will moan about mine. I see on the pit crew section I am listed as Simon. When did that change happen? I think if someone changed my name they should have told me? Dang, thought I'd caught all those. No idea how it happened, Steven - must presume that the name got changed somewhere along the line and the error just perpetuated itself. I weeded out the ones I found but that one in the pit crew section must have escaped me. Sorry 'bout that - I'll get on it straight away. "Sorry 'bout that - I'll get on it straight away. " Oops, I see she gained a mysterious 'n' from somewhere. My sincere apologies to the lovely lady and I will indeed get on to it straight away. As good with names as ever, eh Dad? Not sure if I should comment here or there. Love the site, love the concept but I have one minor suggestion. I'd really like to see the names of the contributors up at the top of each article. The style seems a little inconsistant (sometimes you have a preamble blurb with a name in it, sometimes not). It's less about avoiding writers I don't know and more about recognising the voice from the off - it's just a little bit disconcerting. Point noted and agreed with, Alex. We have changed things to be as you suggest. Thanks for taking the time to point it out. Nice piece of work people. It's really quite amazing how much F1 info is now available...and you seem to have assembled the best of the best. My compliments. Having grown up in Southern California in the 60's, I got my F1 info in monthly installments from Road & Track and many hours of bench racing at California Sports Car Club meetings. Later I added Sports Car Graphic, Car and Driver and Competition Press to my sources. Today, thanks to y'all, I have immediate access to a wonderful array of timely, insightful and reliable info on the passion of my life.